Samsung's latest Galaxy Note 9 is squarely aimed towards enterprise and B2B customers. Samsung has packaged the Note 9 in such a manner that it will appeal to enterprise customers more than ever. There was a sense of confidence on the face of DJ Koh, President and CEO of IT & Mobile Communications Division, Samsung Electronics, when he presented the Galaxy Note 9 as the world’s most powerful mobile device. Koh boldly pitched the Note 9 as a “new smartphone” that raises the bar for speed, power, and performance. During that entire one-and-half hour long keynote presentation, Koh and his colleagues repetitively mention these two words “creators” and “entrepreneurs”. So it makes us understand that the Galaxy Note 9 is squarely aimed towards enterprise and B2B customers. Ever since the first Note device was launched in 2011, Samsung has always promoted the series for work and play. This time though, Samsung has packaged the Note 9 in such a manner that it will appeal to enterprise customers more than ever. The phone has it all; a bigger 6.4-inch screen, a terabyte of memory, all-new S Pen stylus, and larger 4,000mAh battery which Samsung says should provide all-day battery for the heaviest of users. Plus, the Note 9 will also be able to use Samsung’s Android-on-a-desktop mode dubbed DeX, but without the add-on dock, meaning users simply need an HDMI cable plugged into the bottom of the phone and into a monitor. And it’s not surprising to see why Samsung is closely looking at the mobile enterprise market for the next wave of growth. Not many are aware of, but Apple may have a lead over Android manufacturers when it comes to the popularity of iPhones among corporates. While the exact numbers are not known, Apple’s iPhone has been preferred as the choice of a mobile device in the corporate and enterprise space. A recent global survey of executives, managers and IT professionals on choice programmes in the workplace by Jamf revealed that 75 per cent of employees who are offered the choice between iOS and Android as their primary mobile device operating system chose iOS. According to Jamf, the firm behind popular enterprise management software for the Apple platform, the survey was based on the responses from 580 executives, managers, and IT professionals from small, medium, and large organisations around the world. Apple’s iPhone has been preferred as the choice of a mobile device in the corporate and enterprise space. The Cupertino-based company has been slowly and gradually increasing its footprint in the enterprise market, although Apple never shared the revenue numbers on any public platform. In an interview with Bloomberg last year, CEO Tim Cook called the enterprise “the mother of all opportunities”. He sees “Enterprises” as a collection of consumers – and went on to claim that iOS is the preferred mobile operating system for most enterprise customers. “iOS is a fantastic platform because of the ease with which you can write apps that are great for helping you run your business efficiently or interface with your customers directly,” he told Bloomberg. Over the past few years, Apple has forged a number of high-level partnerships with Cisco, SAP, Accenture, Deloitte, GE, and IBM to penetrate deeper into the enterprise market. There’s no denying that business customers have become increasingly important for the company. For Apple, the partnership is a gradual move to win over business clients. Its partnership with SAP, for instance, allows Apple developing software development kit to easier for developers using SAP’s Hana database to write apps for the iPhone and iPad. Due to Apple’s constant efforts to appease corporate users, Volkswagen recently standardised the iPhone for its 620,000 employees around the world. There are a number of factors why Apple has succeeded in the enterprise space in such a short period of time. But the biggest reason why Apple is doing exceptionally well in the enterprise space is also that of the lack of competition from Google. Even though Google’s Android is more popular than iOS when it comes to a number of smartphone activations, the truth is that iOS is a more secure mobile operating system. All iPhones are encrypted and that’s what businesses need the most — the reason why BlackBerry was so popular among corporate and enterprise users at one point in time. Most Android phones are neither encrypted nor run the latest version of the version of the operating system. Plus, all Android smartphones come with “bloatware”, whereas Apple sells the iPhone without any junkware. Big corporates and IT companies make sure the mobile devices they provide to their employees are not only secure but also run the best enterprise apps, giving a quick advantage to iOS over Android. Most Android phones are neither encrypted nor run the latest version of the version of the operating system. Reliability is another big factor that draws the business community towards the iPhone. Android phones struggle a lot in keeping pace with the performance of iPhones. According to the Q1 2018 State of Mobile Device Performance and Health report released by Blancco Technology Group, Android devices demonstrated higher failure rates than their iOS counterpart. In fact, Samsung’s phones had the highest failure rate among the Android manufacturers. 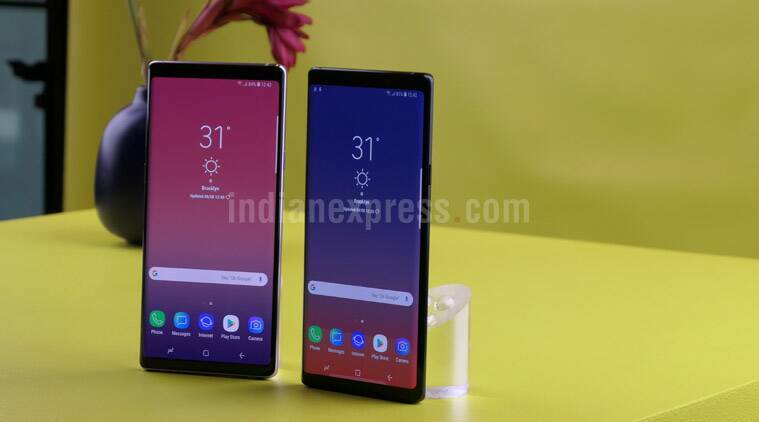 Clearly, the launch of the Note 9 may help Samsung to address the needs of corporates and business users. Although it is hard to say how many smartphones are being sold in India for corporate purposes, it is reportedly Samsung that leads the mobile enterprise market. The adoption of smartphones in the enterprise market is growing and perhaps why Apple and Samsung are chasing business users and corporates with their latest smartphones. Opportunities in the enterprise are plenty; both Samsung and Apple can offer customised hardware and software. The Galaxy Note 9, for instance, uses Knox 3.2 which should be seen as Samsung’s defense-grade mobile security platform. From a security standpoint of view, this is an important feature and will likely entice corporates, IT professionals, and business users to buy the Note 9. “Smartphones are personal computing mobile devices. So, they have to be with the person, whether or not in an enterprise. Hence, the adoption is growing”, Kawoosa said. The Galaxy Note 9 uses Knox 3.2 which should be seen as Samsung’s defense-grade mobile security platform. “The communication channels are changing in organisations, where apps like Whatsapp are now used for formal communications, inter and intra. Most of the enterprises have enabled the mobile version of their ERP applications. Above all the availability of data services at high speeds has also increased the productivity of smartphones for enterprises,” he added. More and more companies are moving to a “bring your own devices” (BYOD) workplace. With BYOD, an employee can use his personal smartphone to access sensitive emails and use apps, rather than using a mobile device provided by an employer. Though it has one big advantage; an employee can use his choice of device for both work and personal use. According to Kawoosa, employees are encouraged to buy their choice out of approved brands and then reimbursed as per eligibility. “Smartphones are not like laptops where an individual can still keep two devices for personal and professional use. People want convenience and with dual sims, even managing two connections, one official and another personal have become easy,” he adds. In fact, Kawoosa does not see many orders vendors get from enterprises these days in India. He sees the trend of corporate buying for employees going down. “It has already moved to BYOD, where at most companies do like to maintain a list of approved brands/handsets that employees can use. Of course, there are categories as per seniority, etc,” he said.